Southern Star Aluminium Windows and Doors are offered in a ‘good, better, best’ range. The three tiers all offer fantastic quality and features, with each upgraded level providing additional benefits. This allows us to deliver ideal solutions to all customers, no matter what size budget they have or features they desire for their homes. The good - 100 Series range offers the outstanding style and quality that has become synonymous with Southern Star Windows and provides everything required for affordable residential housing and low-rise residential units. The 100 Series range of products can also have a place in some parts of custom designed homes. Each product is designed to provide all the features that are required from windows and doors in a home including light, ventilation, design and lifestyle, with the added bonus of a standard of design and manufacture that is second to none. The better - 200 Series range of products that are both visually pleasing and practical. This innovative range of products provides a variety of glazing options to ensure comfort, energy efficiency and performance. There is a product in the 200 Series range that will suit any style and design of home, in particular, where a semi architectural look is required or the design criteria calls for a higher rated product. The 200 Series will satisfy any lifestyle option change, all at a price that provides exceptional value for money. The best - 300 Series is our premium range, combining sophisticated and modern architectural design with superior quality, functionality, style and value. This Series is designed for specialised residential projects where aesthetics, size, strength and performance are priorities. All products in the 300 Series can be double-glazed and are also suitable for most semi commercial projects. 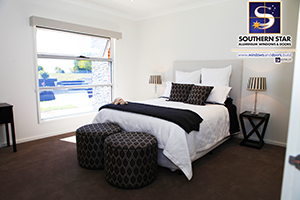 Southern Star Aluminium Windows and Doors can provide the perfect solution for you. Visit a showroom or speak to a sales member about tailoring windows and doors to your exact needs.